The Mountain Valley Milky Ways are hard at work preparing for the First Lego League Championship tournament coming up in March. 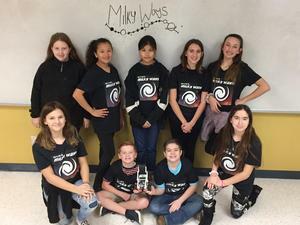 The Mountain Valley Middle School Milky Ways will represent Comal ISD during the First Lego League’s Alamo Area – Curiosity Division Championship Saturday, March 23, at McCollum High School in San Antonio. The Milky Ways advanced to the championship on Jan. 26 during the Alamo Area Curiosity Division Qualifier Tournament at JSTEM Academy where it competed against other First Lego League teams from CISD and other school districts. In fact, two teams from MVMS competed in the qualifier tournament along with teams from Danville MS, Church Hill MS and Spring Branch MS.
Like the elementary teams, which competed recently at Canyon Lake High School, the middle schools worked with this year’s theme, Into Orbit, which challenged teams to choose and solve a real-world problem of space exploration. These middle schools teams are competing in the First Lego League program for fourth through eighth grades as part of FIRST LEGO League which was founded in 1998 by FIRST (For Inspiration & Recognition of Science & Technology) and the LEGO Group. The two joined forces in order to engage young students in science and technology. Today, more than 320,000 students participate in 98 countries in four programs divided into age groups: First Lego League Junior for kinder through fourth grades, First Lego League for fourth through eighth grades, First Tech Challenge for seventh through 12th grades and First Robotics Competition for ninth through 12th grades. Photo: The Mountain Valley MS Milky Ways team includes Madison Askey, Sophia Balderas, Caroline Feucht, Violet Gould, Karen Greenhill, Jacob Tuckness, Joseph Wilson, Madilyn Wilson and Margaret Zulueta.